Big Bollywood Debuts to Expect in 2018. This New Year has a new strand of debutants to flourish their careers with some extraordinary films and their individual performances. Every year there is a list of actors who make a mark in the entertainment business for much more to come. This New Year the list of debutants have increased and we are looking forward to big Bollywood debuts that can make the debutants stand more strong and stable in the entertainment business. While 2017 had some decent debuts from the likes of Saba Qamar and Aadar Jain, 2018 looks much more promising as many star kids are all set to make their silver screen debut in the coming time. Sara Ali Khan: This star kid is all harnessed up for her big debut in Abhishek Kapoor’s upcoming film. Sara’s debut is one of the most anticipated debuts of 2018, as fans are already in awe of the actress and have flooded the social media with their fandom for her. 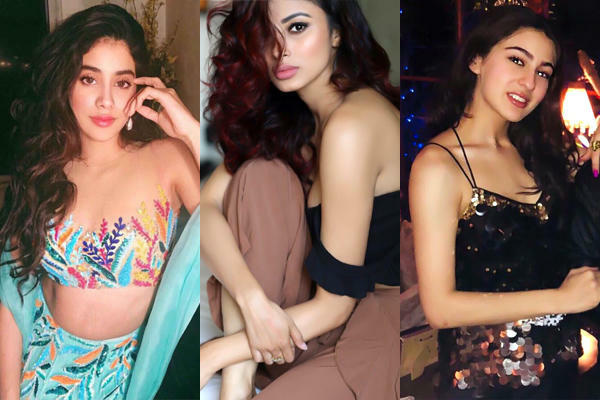 Janhvi Kapoor: Janhvi has a legacy to fulfill and what better way to make your debut than going for Dharma Productions. Janhvi has been extensively prepping for her upcoming film Dhadak, which also stars Ishaan Khattar. Mouni Roy: Mouni Roy is all set to make her big debut in Excel Entertainment’s Gold. Mouni has got the looks and the skills to nail her debut opposite Akshay Kumar. The actress has impressed everyone with her performances on TV and now everyone will be amazed by her silver screen appearances. Karan Deol: Karan is the son of Sunny Deol and Karan is all set to make his debut in a rom-com titled Pal Pal Dil Ke Paas, which will be backed by his father. Ahaan Shetty: After Athiya Shetty successful launch in the Bollywood business, Ahaan is ready to tell he is no less by making his debut in Sajid Nadiadwala’s untitled film. So, above is a small list of actors who will be debuting this year. Let’s see who flourishes the best. Have You Heard About Sapna Choudhary's Bollywood Debut Yet? Shweta Tiwari's Daughter is Making Her Debut Soon, But with Whom? Sooraj Barjatya’s son to make his debut with Salman Khan? Is Sonali Bendre making her directorial debut with ‘Aarambh’? Christmas Cookies You Will Love! Kis Kis Ko Pyar Karu? Tiger Shroff All Set To Debut! India's First Superstar Now on TV!